Remember when you get to the track you can always ask one of our volunteers questions anytime. Bicycle Motocross or BMX is a sport where riders of all ages use manual power to maneuver a pedal bike over jumps, banked corners and other obstacles. BMX was created by kids but it’s becoming popular with older racers as well. Unlike most sports, BMX racing depends 100% on your performance, not the combined performance of a team, or team effort. Riders compete in classes, and will remain with that class until he/she has a birthday or he/she progresses by first place wins. Statistics have proven that BMX racing is one of the safest of all sports today. Part of this is due to the mandatory safety requirements. All Riders at Waterford Oaks MUST wear long sleeves, long pants and a full-face helmet. BMX is an excellent individual and family orientated sport. Races are organized into girl’s classes and boys classes, and then subdivided into age groups and skill levels. The age groups range from 5 & under classes to 51 & older. Within these age groups are three skill levels: Novice, Intermediate and Expert. All riders start as Novices and must work up to the more advanced levels by winning races. A Novice must move up to the Intermediate class after they have 6 wins in the Novice class. An Intermediate must move up to the Expert class after they have 25 wins as an Intermediate. There is also competition in the Cruiser class for boys and girls. The age groups for the Cruiser class are 7 & under to 56 & older. You can obtain a USA BMX thirty-day trial membership for $30. A trial membership is good only at the track where purchased. During the thirty-day trial, you can upgrade to full membership for only $35 more. If you would like to skip the trial membership, you may purchase a full membership for $60, that’s a savings of $5 over the trial membership with the conversion cost. The full membership is good for one year from the date of purchase. Once you have your full membership, points will be awarded to you at each race and you may compete in any USA BMX sanctioned event. You can get family discounts when signing up additional family members. Open ride fee is $5; race fee is $7 (ribbon only) or $10 (for trophy) awards are given to 1st – 4th place in the main event. What Does My Bike Need to Be Track Ready? We have onsite bikes and helmets for rent if you need them. The first thing you need to do is come and sign-up at the registration building. 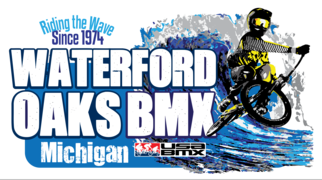 It is there that you’ll fill out a USA BMX application and an Oakland County Parks waiver. When you’re ready to start riding you will need to take your bike up to the starting hill. Again, we recommend that you spend a few moments watching the other riders and how they use the gate. It is very important that you wait until the gate is all the way in the up position before your bike into the gate and then begin to set up your bike. If you have any questions or concerns before starting please speak to the gate operator and they will be happy to assist you. Obviously, the more you ride your bike, the better you will get. That old saying “Practice makes perfect” stands true in the world of BMX racing. Check our Calendar of Events for open ride times and come out as often as you can. Throughout the year, Waterford Oaks BMX offers Beginner Riding Clinics. Attending a clinic is one of the best ways to learn how to get better in BMX. Clinic dates and time will be posted on our web site as well as announced at the track.